6 These authors did stress, however, that jaw-movement patterns varied with the structural and mechanical properties of the foods as well a sthe position of a chewing cycle in a chewing sequence. also have argued for a general uniformity of jaw-muscle activity patterns during chewing. Their argument implies that the structural changes in the jaws and teeth of recent primates have taken place within a behavioral framework established early in primate evolution (Hiiemae, 1984; Hiiemae and Kay, 1972, 1973; Kay and Hiiemae, 1973). We are now beginning to accumulate jaw-muscle EMG data from enough primate species to realistically evaluate whether primates share broadly similar jaw-muscle activation patterns during chewing. Prior to discussing this hypothesis, we need to make clear that similar jaw movements during chewing may be created by different jaw-muscle activity patterns. Thus, even if primates move their jaws in the same way (a proposal requiring further testing), we still could see different jaw-muscle activity patterns creating these movements. We also want to clarify that primates move their jaws in orbits during chewing. At this level all primates are alike. This shared similarity, however, is likely a physical requirement for repeated chewing cycles and as such is not particularly interesting for studying the evolution of primate chewing. Examination of the W/B ratios indicates that treeshrews and primates show marked variation among species in the relative magnitudes of jaw-muscle activity on the working-versus balancing-side during chewing (Table 4). The systematic differences in W/B ratios in anthropoids versus strepsir-rhines and treeshrews suggest that this variation may characterize larger primate clades. Given that we have discussed W/B ratios at length above, we will not consider them further except to emphasize that all primates do not appear to recruit similar magnitudes of relative working-and balancing-side jaw-muscle forces during chewing. The temporalis muscles show the most consistency across primates and treeshrews in peak firing times. The working-side temporalis peaks on average before the balancing-side temporalis in all of the taxa in Table 5. The working-side temporalis typically peaks at about the same time as the balancing-side superficial masseter with the possible exception of platyrrhines. The balancing-side temporalis usually peaks late in the power stroke typically after the peak of the working-side superficial masseter. Again with the potential exception of the South American primates, the balancing-side superficial masseter typically peaks before the working-side superficial masseter in primates and treeshrews. The consistency of temporalis peak firing times across primates is interesting given that it is also the largest jaw-closing muscle in primates (Cachel, 1979; Turnbull, 1970). Callitrichids and owl monkeys appear to have a jaw-muscle firing pattern that does not always follow this triplet pattern described above. In some individuals, the balancing-side superficial masseter (BSM) peaks on average slightly after the working-side superficial masseter (WSM). These peaks, however, are quite close in time suggesting that a more realistic interpretation is that on average the two muscles are peaking at about the same time. We cannot say presently whether the triplet pattern has been altered so that the BSM is delayed or the WSM is advanced in these animals. If this pattern is present in other platyrrhines, then it suggests that platyrrhines have evolved a distinct jaw-muscle firing pattern. The deep masseter shows the greatest variation in peak firing times across primates and treeshrews (Table 5). The working-side deep masseter (WDM) peaks quite early in ring-tailed lemurs and cercopithecoids. 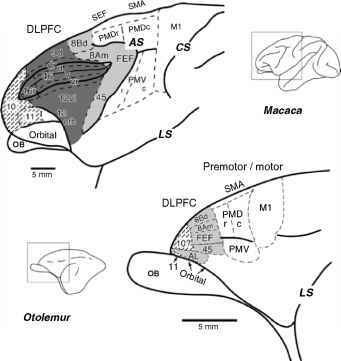 The WDM peaks much closer to the working-side superficial masseter (WSM) in galagos and treeshrews and close to the working-side temporalis in platyrrhines. Furthermore, the balancing-side deep masseter (BDM) is the first muscle to peak on average in galagos. Although the BDM does not peak first in treeshrews and lemurs, it does on average peak well before the WSM in these species. In contrast, the BDM peaks after both the working-side and balancing-side superficial masseters in baboons, macaques, owl monkeys and callitrichids as part of the "wishboning" firing pattern (Hylander and Johnson, 1994; Hylander et al., 2000). Finally, humans do not appear to show this relatively late peak of the balancing-side deep masseter (van Eigden et al., 1993). Mammals appear to be extremely labile in their deep masseter firing patterns relative to the other jaw-closing muscles. If we assume that the BDM peaked before the WSM in primitive mammals, then the late peak activity of the BDM appears to have evolved at least six times in mammals. EMG data indicate that rabbits (Weijs and Dantuma, 1981), pigs (Herring and Scapino, 1973; Huang et al., 1994), alpacas (Williams et al., 2003), horses (Williams et al., 2003), anthropoids (Hylander and Johnson, 1994; Hylander et al., 2000), and sifakas (Hylander et al., 2003) exhibit this late-peak activity in the BDM. Based on the EMG data from van Eijden et al. (1993), humans may have evolved an early average peak of the BDM (i.e., before the WSM) from an anthropoid ancestor exhibiting a late peaking BDM. The alternative interpretation of the human deep masseter EMG data is that New World and Old World monkeys convergently evolved a late-peaking BDM (cf. Ravosa, 1999). The interspecific variation in firing times for the deep masseters as well as the convergent evolution of the late peak activity of the BDM is likely related to transverse jaw forces during the power stroke (Herring and Scapino, 1979; Hylander and Johnson, 1994; Hylander et al., 2000; Ravosa et al., 2000; Weijs, 1994). The orientation of the deep masseters tends to have a relatively large transverse component of pull during contraction as compared to most of the other jaw adductors. Thus, the deep masseters may be more effective in creating transverse jaw movements and/or transverse occlusal forces during chewing. Alternatively, the deep masseters may be freer to vary their recruitment patterns than the other jaw adductors. If so, then the remaining jaw adductors may be constrained to produce vertical and/or transverse forces and jaw movements at specific times during the chewing cycle. The deep masseters may be acting to modify existing jaw movements and/or occlusal forces during chewing, particularly those in a transverse plane (e.g., Hylander and Johnson, 1994; Ravosa et al., 2000). If we accept treeshrew jaw-muscle activity patterns as primitive for primates, then we can reconstruct early primates as firing their superficial and deep masseters as a more or less single unit. Thus, primates may have evolved several modifications of their deep masseter firing patterns. The early peak activity of the WDM may be functionally related to positioning the mandibular molars for the upcoming power stroke. The early peak activity of the WDM in ring-tailed lemurs indicates that this WDM pattern can evolve in species with unfused symphyses. Functionally, this observation suggests that transverse jaw movements during the closing stroke may not involve significant stresses at the mandibular symphysis. In anthropoids, the changes in the deep masseter-firing pattern have been argued to reflect an increased emphasis on transverse jaw movements and/or force production during the power stroke (Hylander and Johnson, 1994; Hylander et al., 2000; Ravosa et al., 2000). Regardless of the functional interpretation, the timing of peak activity in the primate deep masseter appears to be easily and routinely uncoupled from the superficial masseter and the other jaw adductors throughout primate evolution. This observation may be characteristic of mammals in general. In summary, there are distinct differences in jaw-muscle activity patterns among these primate species. We anticipate that studying additional primate species will likely add to this variation. Based on the existing EMG data, we find it difficult to conclude that primates have similar jaw-muscle activity patterns during chewing and that all primates chew in a similar way. Having said this, it is clear that certain muscles, such as the temporalis, show broadly similar activity patterns during chewing across primates and treeshrews. Hiiemae and Kay's (1972, 1973) assertion may be correct for specific aspects of primate chewing behaviors—such as this similarity in temporalis timing patterns. It is probably misleading, however, to characterize primate-chewing behavior as similar because it masks the observed interspecific variation in EMG activity patterns in other muscles. We must appreciate this variation in order to understand the evolution of chewing behaviors in specific primate clades. Furthermore, it remains to be seen whether these behavioral modifications are correlated with morphological changes in primate jaws.